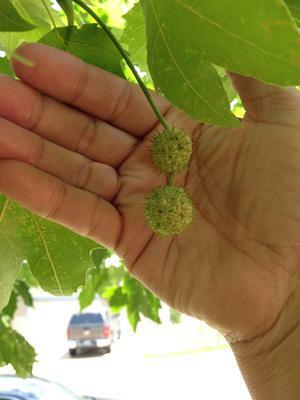 I have a tree that is shedding (not sure what kind of tree), it also has holes in its leaves as well as spiky-like balls hanging from it? Not sure if this is a natural shedding that is happening or if it has a disease? Thanks. 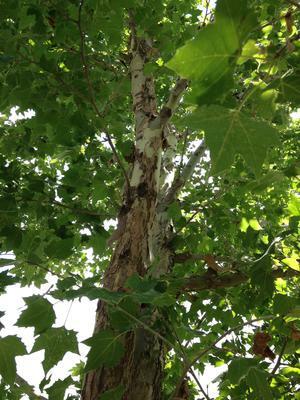 Which in common language is the London Plane tree. 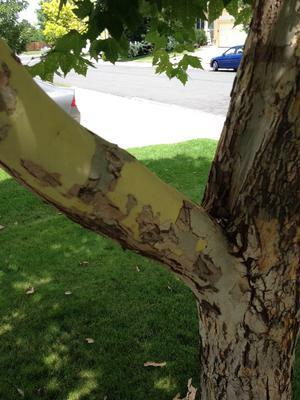 The exfoliating bark is normal, and one of this species best features. They are tough and reliable, and can withstand air pollution, cramped roots and most pests. They are planted as street trees in many cities in Europe, including London, England, hence the name. The spiky balls are the fruits, which if left to their own devices can germinate in unwanted places, so if you don't want any more of these trees, sweep them up and dispose of them where they won't grow. Like many trees they are host to many insects. The tree can survive with only a fraction of their leaves, so unless the creature is completely denuding the tree, I wouldn't worry about it. I can't see the damage closely enough to even hazard a guess as to what would be causing it, sorry. 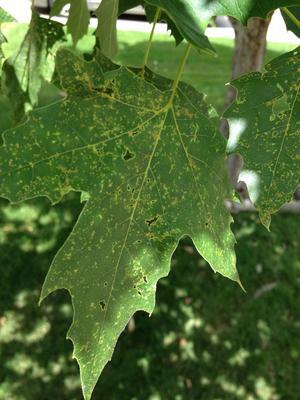 Luckily, most deciduous trees (those that shed their leaves in the fall) can survive quite well because they'll make new leaves next season. One thing you can do to prevent a re-infestation of pests is to rake up the leaves and compost them in a really hot pile.